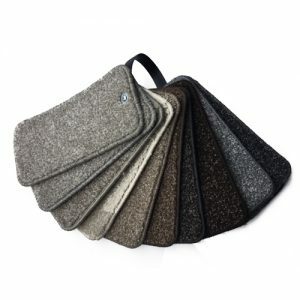 Revolution is a fantastic twist pile carpet range from Condor Carpets. It offers excellent value for money and is available in 22 different colours as well as 4m and 5m widths. In addition to the flexibility of this range, Revolution is also practical and well made, which is further demonstrated by its Action Backing. The pile content for Revolution is made from 100% Polypropylene, making it stain resistant and hardy enough to cope with heavy duty cleaning. This carpet has been rated as suitable for heavy domestic use, it is usable in areas of traffic. The heavy domestic range that is Dalton Extra comes in an attractive range of 13 different colour choices and is available in 4 and 5 metre widths. A popular cut pile choice it comes with a ten year stain and wear warranty and is stain resistant and bleach cleanable. The luxurious Noble Collection by Balta Broadloom not only offers great value, it comes in a fantastic range of colours and stripes too. 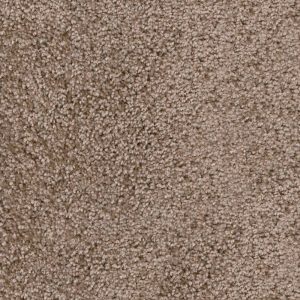 If you’re looking for comfort underfoot at a very reasonable price, this carpet flooring could be the perfect choice. The Noble Collection is available in two different backings, either a felt backing or action backing. The action backing is more hardwearing than the felt backing. This carpet comes in either 4m or 5m widths, so that you can order just what you need and avoid wastage. Another benefit of this range is that a 10 year wear warranty and 15 year safe stain warranty is included. The Rosewood Heathers from Balta is a luxurious carpet that comes in a series of contemporary home-warming colours each with a flecked design. Made from 2-ply 100% Stainsafe Polypropylene yarn with an impressive 13mm pile height, it is durable, bleach cleanable, stain safe and suitable for many rooms in your home. It comes with a 10 Year Wear Warranty and a 15 Year Stain Safe Warranty. Offering High Quality Carpets at Cheap Carpet Prices,Plus Laminate Flooring And Vinyl Flooring All With Huge Savings And Discounts! 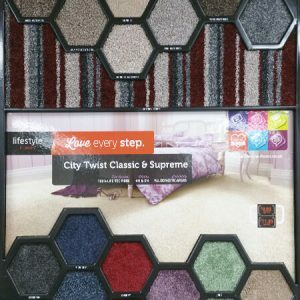 City Twist Supreme by Lifestyle Floors is made from 100% life-tec fibre and comes in a action backing. City Twist Supreme is suitable for all domestic areas and comes with a 10 year wear warranty. The fantastic Saxon King carpet range from Balta is a luxury heavy weight saxony carpet that will add warmth and comfort to any room in your home. Heavy domestic rated, the Saxon King carpet by Balta is suitable for use in any room, hall, stair or landing. 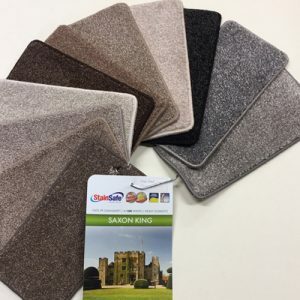 Made from 100% Stainsafe Polypropylene, the Saxon King carpet is very easy to clean and maintain, being 100% bleach cleanable, an ideal choice for the family. Using quality Stainsafe carpet pile, the Saxon King carpet comes with a 10 year wear and 15 year stain safe warranty. Utilizing 2-ply yarn, it is suitable for areas of traffic in your home. 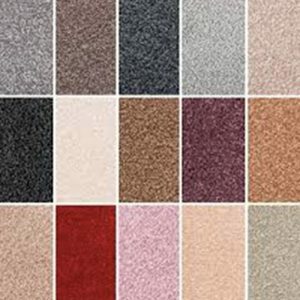 The Carousel range by Condor Carpets is hardwearing, easy to clean and is available in many beautiful shades too. This is a twist pile carpet, made with 100% Polypropylene that has been specially designed to take heavy cleaning, even with diluted bleach. Because the Carousel carpet is suitable for heavy domestic use, you can use it in most rooms of the home. 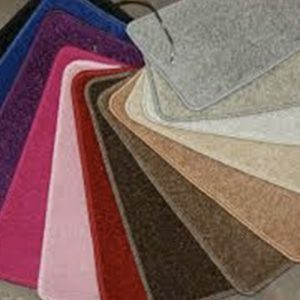 It is available with an Action Backing which plays an important part in helping this carpet last for a long time. 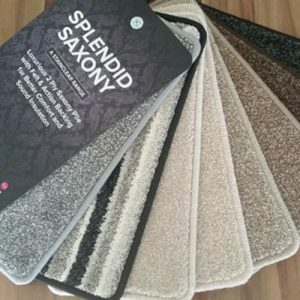 The Splendid Saxony Action back Carpet Range has a super soft feel underfoot, with a range of earthy tones and a modern striped design. 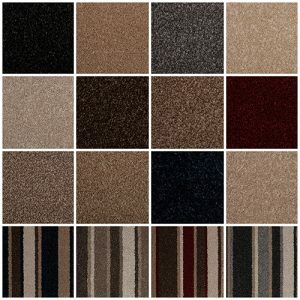 This carpet is available in the following colours; Cream, Light Beige, Beige, Brown, Silver Grey, and Granite Stripes. The colours have varying earthy tones, with a warm, homely feel. The polypropylene fibres are stain resistant, and you can quickly clean everyday spills and dirt with a mild bleach solution. The pile is a 2-ply polypropylene construction, with each stripe having a mixed, flecked appearance that adds depth and softness.